Tim Gajser, the 2016 MXGP World Champion, will remain with Team HRC in the FIM Motocross World Championship, MXGP, for another two years following the signing of an agreement with Honda Racing Corporation. 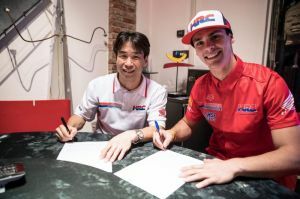 Whilst it has been no secret that GT243 has a desire to race in the United States, for the short term at least, he, alongside HRC and the Gariboldi team, has decided to remain in MXGP where he will mount a new challenge to bring the World Championship back to Honda aboard the much-revered #243 CRF450RW. Gajser’s current deal with Honda, which was signed in 2015, runs until at least 2020. The Slovenian joined the Japanese marque for the 2014 season and since then his ascent has been remarkable – six GP podiums followed in that first year, then 2015 brought his first race win en route to his MX2 World Championship title. The next year, he became one of just four Honda riders to take back-to-back crowns in different classes with his rookie MXGP World Championship title. For the 2018 season, GT243 lines up on a further-improved Honda CRF450RW alongside Brian Bogers on the #5 machine, and with teammate Calvin Vlaanderen on the #10 CRF250RW, all running from beneath the Gariboldi-run Team HRC awning. Gajser has recently attended the Honda Racing Thanks Day in Motegi, Japan – the traditional season-ending fan event which brings together Honda Racing’s stars and world champions and a packed grandstand of fans. Alongside the likes of Marc Marquez, Dani Pedrosa, Jenson Button, Stoffel Vandoorne, Akira Narita and Takuma Sato, Gajser took part in a range of track activities which included racing karts, Super Cubs, and Honda Sport & Eco Fit cars.